Carl Enoch was an itinerant salesman for the German company Littolf Publishers when in 1853 he set up a music publishing business located in Paris, 27 boulevard des Italiens. From the beginning, Carl brought his young children into his business in order to introduce them to music publishing. It was Carl’s eldest son, Wilhem, who succeeded his father in the 1880’s. He took over the firm in which he had already been collaborating with Carl for twenty years. Wilhem created his own catalogue of musical works. At the same time, Wilhem’s youngest brother, Charles Enoch migrated to London, England where he set up the music publishing house Enoch and Sons. Wilhem gave a new life to the business by launching a new publishing policy which seemed both unusual and contradictory. 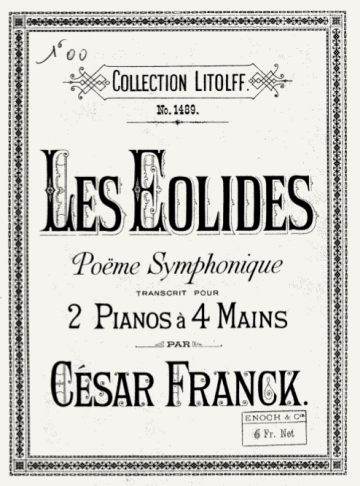 He decided to split his catalogue between on the one hand, serious works of symphonic or religious music (for example Les Éolides by César Franck), España by Emmanuel Chabrier or the Romanian rhapsodies by Georges Enesco) and on the other hand, popular and light music like songs by Paul Delmet or operette by André Messager. The reputation of Enoch & cie was also based on the educational tradition and music teaching methods like, for example, the Traité de la fugue by André Gedalge which has been one of the best references since its publication in 1904. Very quickly Enoch & cie established relations of trust and closeness with their composers. Most of them remained faithful to the family ; Cécile Chaminade is the best example of loyalty as 170 Opus were published by Enoch. Besides publishing prestigious composers, Wilhem was on the look-out for young talents. He eventually discovered Maurice Ravel, whose very first work, Menuet antique, was published by Enoch & cie. As a matter of fact, Ravel’s last composition, an orchestration of Chabrier’s Menuet pompeux in 1936, was published by Wilhem’s son, Daniel. In the 1910’s Daniel Enoch ran the publishing house with his younger brother Georges. Daniel perpetuated the educational tradition of the family by publishing several instrument methods (piano, oboe, clarinet, violon, cello, timpani, etc.) as well as music theory methods. L’Organiste, published after César Franck’s death, or the 15 études de virtuosité by Moritz Moszkowski are the best examples of these methods. Daniel maintained his father’s particular edition policy by publishing popular music like the Marche lorraine by Louis Ganne or songs by Francis Poulenc as well as orchestral music like L’Angélus de la mer by Gustave Goublier. When World War II broke out, the business was stopped. Daniel Enoch and his wife were killed in Auschwitz-Birkenau where they were deported in 1943. In 1944, Jacques Enoch came back from Savoy where he had taken refuge during the war. The firm was in bad shape but Jacques managed to rebuild it. He developed the publications of his ancestors and gave a chance to young talented composers such as Joseph Kosma and Darius Milhaud. Jacques extended the traditional publishing policy by being faithful to the poetic songs as well as to symphonic works. For several years he held simultaneously the managerial functions of music publisher and the office of managing director at the SACEM (French Society of music authors, composers and publishers). 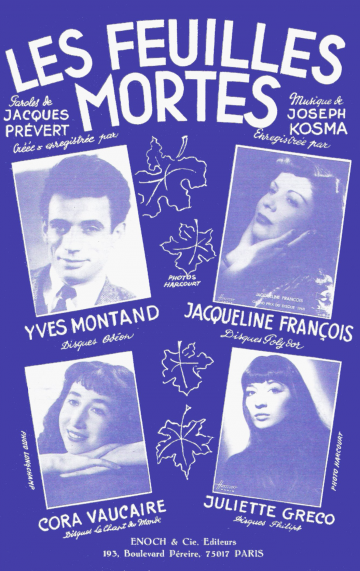 Being a close friend to artists like Jacques Prévert and Joseph Kosma, Jacques added popular songs and movie soundtracks to the catalogue, such as Les portes de la nuit by Marcel Carné, which featured the international hit Autumn Leaves. At the same time, the catalogue was strengthened with classical works such as the Concerto pour marimba or the Suite concertante by Darius Milhaud. Janine Enoch succeeded her husband Jacques in 1990 as the new managing director. She wishes to highlight the company’s centenary musical heritage and works for the publication of 19th century composers like Emmanuel Chabrier whose Lamento pour orchestre as well as a Prélude and a Marche française for four-hands-piano were re-discovered and performed in 1995, 101 years after the author’s death. Nowadays, Enoch & cie keeps on protecting its large catalogue made up of almost 1700 scores and has re-published a diverse set of forgotten works from its catalogue such as La Czarine by Louis Ganne, le trio aubade by Georges Enesco, as well as Le Portrait, L’Anneau d’Argent, Le Prélude pour orgue, Les Noces d’argent for piano or the Sonate en ut mineur, Opus 21 by Cécile Chaminade, or songs by Paul Delmet. Last but not least, Antoine Mariotte’s opera Salomé has recently been acclaimed at the Radio France Festival and at Montpellier’s opera.